Sometimes parties can be fun. But sometimes parties can be disappointing too. What makes a party fun? What makes a party disappointing? In church yesterday, we heard about a party that Jesus went to [John 2: 1-11]. It must have been fun, because it was a wedding … and it lasted for a few days. Weddings can be good fun. Have you been at a wedding? Have you had good fun? Jesus goes there with his mother, Mary, and his closest friends, his disciples. And what happens is at a wedding we change the shape of our families. We get new uncles and aunts, new cousins, new nephews and nieces. But sometimes weddings – like all parties – can turn to disappointment, and people stop having fun. Someone tried to stop the fun at this wedding. But Jesus puts an end to that by turning water into wine – a lot of water, and a lot of wine. There were six stone jars with water for rites of purification – not water for drinking, but water that was like, say, the water we use for Baptism. Each jar had 20 or 30 gallons. So Jesus turn all this water into 180 gallons of wine – roughly speaking, in today’s terms, 1,091 bottles of wine. So, no-one is left embarrassed at this Wedding at Cana about the missing ingredients at the party. Jesus makes sure the wedding party can continue, not just for the evening, but for a few days more. 1, The story shows that Jesus is both human and divine. 2, The story shows points to Jesus offering the very best in life. 3, Jesus takes away all our embarrassments – if you like, he saves us from all that is sinful. 4, Jesus shows how God is over-generous, how God’s love for us is never-ending, how God’s goodness is beyond our imagination. 5, Jesus wants us to be part of God’s party In the waters of baptism, God calls us to be part of God’s party, to join him at the Heavenly Banquet. This reflection was prepared for a school assembly in Rathkeale on 21 January 2019. When I worked as journalist with the Wexford People in the mid-1970s, I lived in High Street, opposite the rear entrance to the People print works and offices, in premises that have since become part of the Opera House. 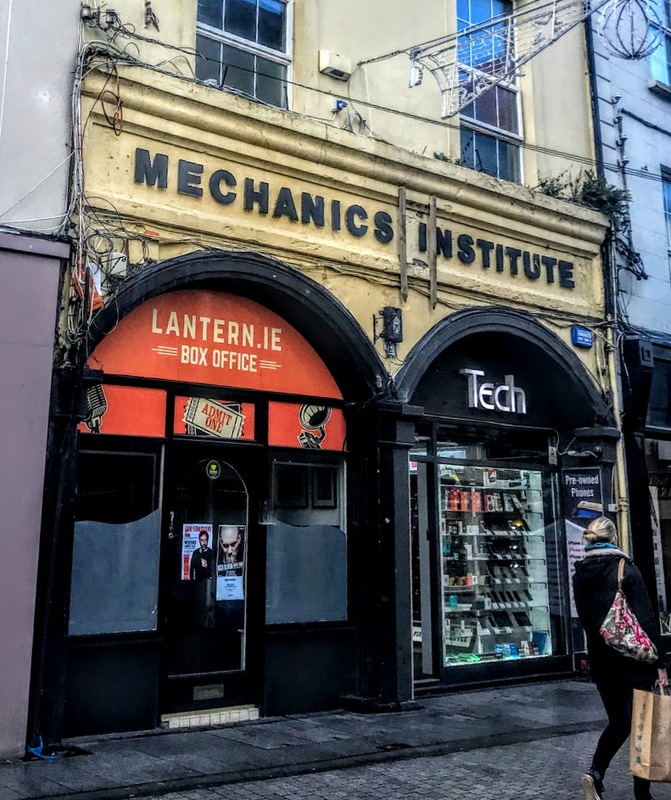 The commercial and editorial offices were above the front shop in the former Mechanics Institute, a once-elegant Victorian building with an interesting arcaded shopfront on the ground floor. In the floors above, we produced a number of provincial newspapers, including the Wexford People, the New Ross Standard, the Enniscorthy Guardian, the Wicklow People and the Bray People. Long after I left, the Wexford People moved to purpose-built premises at Channing House on Rowe Street. But as I walked past the former Mechanics Institute building on North Main many happy memories were revived, and once again I found myself appreciating the architecture of this unique building with a curious story. In recent times, since the Wexford People left these premises, the building has been used as an information hub, a ticket booth for festivals such as the Wexford Winterland festival. 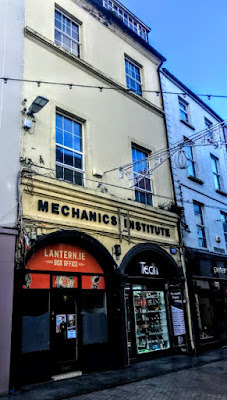 The building dates back at least 170 years to the foundations of the Mechanics Institute on 13 July 1849. The first meeting to establish the institute was held in the Temperance Hall in Selskar in June 1849. Those present included James Johnson, the first editor of the People, who later became a Redemptorist priest in England; the Revd William Moran, later Parish Priest of Clongeen; Michael Hughes; George Codd; Thomas McGee, associated editor of McGee’s Weekly, later a lieutenant-colonel in the US army, and a brother of Thomas D’Arcy McGee; and Benjamin Hughes of the Wexford Independent. The idea for institute may have been articulated first by Benjamin Hughes, who had been reading articles in the People’s Journal on Mechanics’ Institute. Johnson too was eager to establish a similar club for working men in the town. The meeting asked Ben Hughes and George Codd to seek the support of Charles Arthur Walker, the Vice-Lieutenant of Co Wexford, and Sir Francis Le Hunte (1787-1859), a distinguished naval officer who was a veteran of the Napoleonic wars. Walker and Le Hunte both expressed enthusiastic support for the idea, a site was bought, and a three-storey building on Main Street facing Anne Street was built for £800. Much of the money was raised in house-to-house collections in the town, but Le Hunte personally donated £100. Le Hunte had planned to leave his home, and intended to give his collection of books and corals to the new library in Clonmel, Co Tipperary. But he now changed his mind and donated it all to the Mechanics Institute in Wexford. 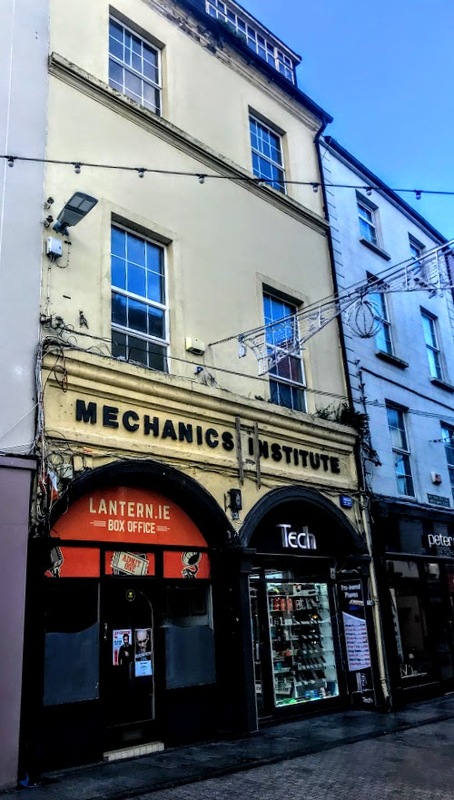 The institute building is a terraced, two-bay three-storey building with a dormer attic, designed by the architect and surveyor Edwin Thomas Willis (1835-1905) of Rowe Street, Wexford. The completion of the building was delayed by a fire in July 1859 at the premises of the contractor, Richard Pierce, but the building was finally roofed by 19 August 1859. When it was opened, it was described as a new building opposite Anne Street, with a splendid reading room measuring 33 x 24 ft, a museum, library, a committee room, a caretaker’s apartments and a spacious hall. There is a pair of segmental-headed openings on the ground floor, with pilasters on plinths supporting moulded archivolts framing the fittings. The square-headed windows on the upper floors have classical stucco refinements, including moulded rendered sill courses and rendered bas-relief surrounds framing the uPVC casement windows that have replaced the original six-over-six timber sash windows. The features of the building include a compact plan form, the arcaded street front, windows that diminish in scale on each floor creating a graduated visual impression, and a high pitched roofline. The architect Edwin Thomas Willis, who was born ca 1835, was a son of the Wexford artist John Willis and a grandson of the architect and building contractor Thomas Willis. Willis married Fanny Collins in Donnybrook Church, Dublin, in 1858. They lived at 11 Rowe Street, Wexford, around 1859-1864, and later at Henrietta Street, Wexford. They had at least one son, Richard John Willis, who emigrated to the US. Willis died ‘rather suddenly’ at his son’s house in Syracuse, New York, in early 1905. Willis also designed the YMCA on North Main Street, Wexford, and the Irish Round Tower erected at Ferrycarrig in 1857 to commemorate the officers, non-commissioned officers and men from Co Wexford who died in the Crimean War. The institute rules included ‘no papers to be read at fire’ and ‘no paper to be held more than 15 minutes.’ The cost per annum for apprentices was 4 shillings, for operatives 6 shillings, and 10 shillings for others. Life membership was available for £5 or the donation of a book valued at £10 or more. Sir Francis Le Hunte died the year the institute opened, leaving another £600 to the Mechanics Institute. Benjamin Hughes, who has been described as the ‘originator of the institute,’ continued to work at building up the collection in the library in the institute. 1,000 volumes and a coral collection donated by Le Hunte. 300 volumes presented by Francis Codd (d. 1857) of Ballytory Castle, Co Wexford. 100 volumes presented by William Boxwell West (1802-1877), who had been a practising lawyer in Wexford. In 1845, he and an engineer named McCall promoted a scheme for a railway line from Wexford to Valentia in Co Kerry. The proposal was supported by the Duke of Wellington, and an act of parliament was passed to allow it the line to be built. However, the Great Famine put an end to the plans, and in 1851 West moved to Dublin, where he was appointed the US Consul in 1861. Over 100 volumes, ‘including all her own works,’ donated by the novelist and playwright Mrs Samuel Carter Hall (1800-1881), who was born Anna Maria Fielding – she was descended from the Fielding family of Bannow and had further Wexford links through her stepfather, George Carr of Graigie. 100 volumes presented by John Lloyd (1780-1853) of Thornville, Co Wexford. 40 volumes donated by the explorer and writer Dr Thomas Joseph Hutchinson (1820-1885). A single book, ‘with autograph,’ presented by Queen Victoria. The library also held a collection of curiosities donated by Hutchinson the explorer. Hutchinson was born at Stonyford, Co Kilkenny, and after studying medicine became a surgeon and physician in Saint Vincent’s Hospital, Dublin. After a trip to West Africa in 1851, he was chief surgeon on the Niger expedition (1854-1855). After two years as British Consul at the Bight of Biafra and Fernando Po, he was appointed Governor of Fernando Po, now the island of Bioko in Equatorial Guinea, in 1857. He was transferred in 1861 to the British consulate at Rosario in Argentina, where he took part in the Salado expedition in 1862. He was appointed Consul at Callao in 1870, and three years later retired to his Irish home. He died in Florence on 23 March 1885. A glass-case displayed specimens of paper banknotes from many countries, including the United States and the Confederate States. There were portraits of Le Hunte and Benjamin Hughes by the Wexford artist Ambrose Fortune. The meeting room of the institute also served as a library and museum. It was ‘lofty, well-lighted and well ventilated.’ Other facilities included a billiard room and committee rooms, one of which may have been the room we worked in as sub-editors. For several years, Robert F Wyke taught drawing and French classes in the institute. But eventually the institute went into decline, and its educational functions depended entirely on the books, the museum, the daily Dublin newspapers, and English and American magazines. The institute eventually wound up, and today the whereabouts of the library and the museum collection are unknown. The architectural value of the building makes it is an important part of the mid-19th century built heritage of Wexford. But whatever happened to the bamboo crown, the fetish idol, the blue-faced Chimpanzee, the royal drum and the one-stringed harp?